I just designed a tufted wrap-around bench that we're custom-building for a client's breakfast nook, and now we're in the midst of choosing the rest of the elements in the space. We need to decide between two different fabric combos, so that's what I've got on the brain right this minute. The alternate combo has the pagoda fabric on the roman shades paired with a white vintage tole light fixture because I think a coral fixture would be too much in this case. So which do you prefer?? 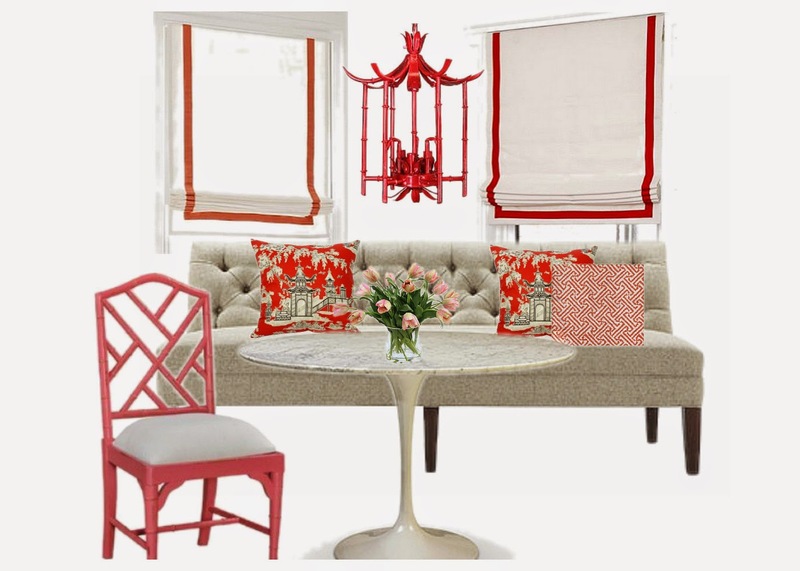 I like both, but I'm leaning towards #1 because I love the red lantern paired with the marble-topped tulip table. I just love the red lantern, period. Whichever scheme I go with I'll probably include in a pillow or two in Quadrille's Java Java or Saya Gata, two classic fretwork prints that will look fabulous with the coral laquered fretwork Chippendale chair we have. Just the one chair, as the tufted bench will actually wrap around on 3 walls leaving space for only one accent chair. Fine by me because as much as I love Chippendale chairs, they can look a bit busy as a whole set ... that's a lot of lines. So what's your pick, combo #1 or combo #2? I like both, but I think I like #2 better. #1 has a lot of red lines with the shade border, lamp, and chair. Either way, can't wait to see it all come together! I vote for #2 because that gorgeous fabric gets shown off a bit more and also I think the light fixture in #1 is a bit too on-the-nose/matchey-matchey. I go for no. 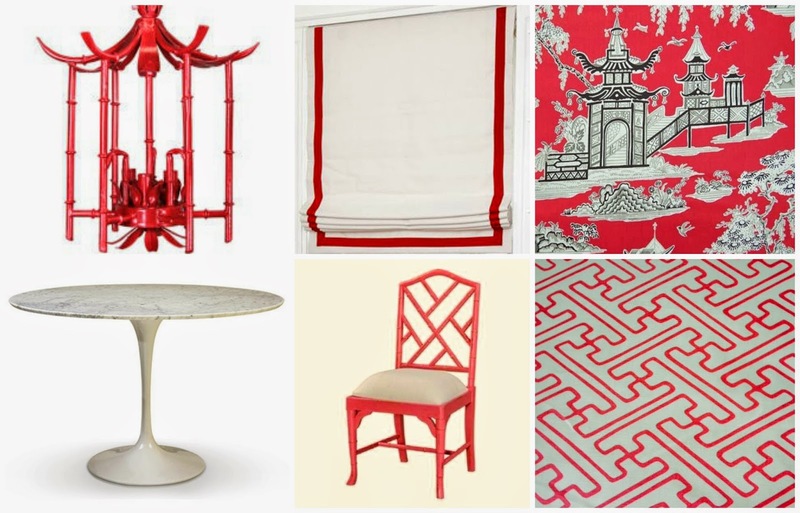 1 - the white in the blinds give the eyes a place to rest as the chinoiserie is very busy, but I love the red! I definitely prefer # 2. 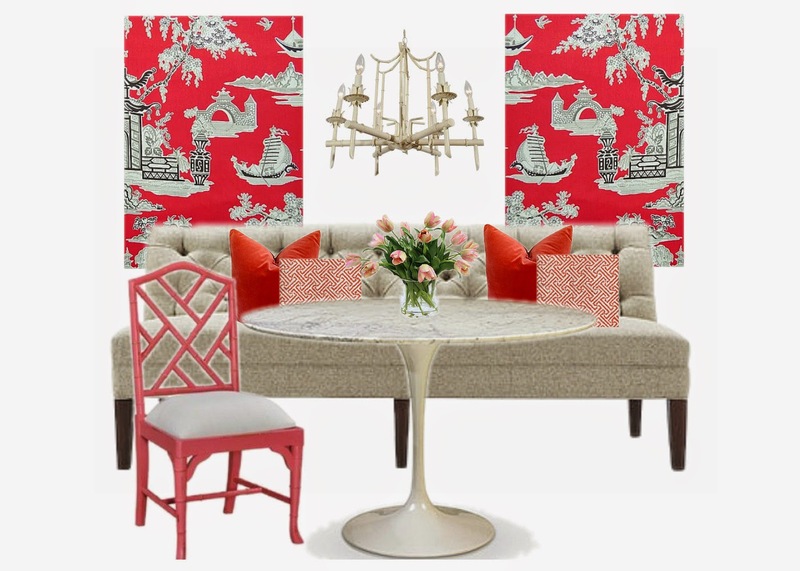 The red chandelier stands in stark contrast to the beautiful and classic Sarinnen table. The lines of the table and the chandelier should to me be continuous, unbroken and complimentary. It should reads as one sculptural piece. The fabric on the shades forms a beautiful background. Number 1 has a "clownish" look to me with too many strong contrasts popping up everywhere. I agree that #1 is classic and #2 is too busy. Those classic roman shades with the red trim are ones that you will never tire of, the pattern shades will need to be changed in a year. I love #1, mainly because of the roman shades, very simple and you will not grow tired of them in the simple white with red trim.